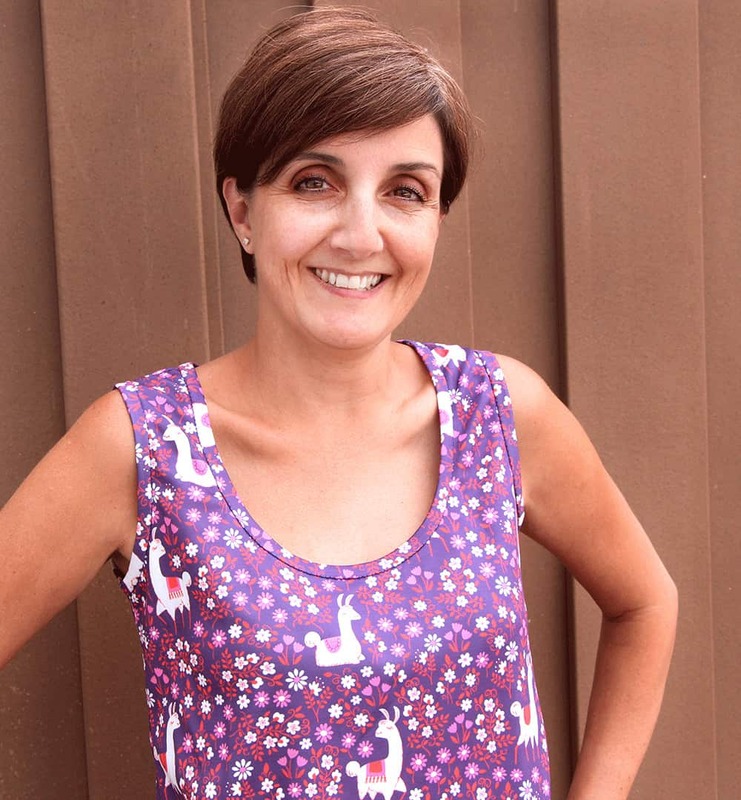 Sometimes hemming knit fabric garments can be a little fussy, but Spoonflower crew member Teri is here to show you how to finish off your knit tops beautifully with a simple rounded neckline. 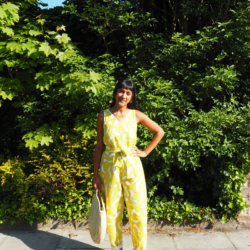 Armed with this technique, you’ll be sewing knit necklines, armholes and hemlines with ease! Choose which knit fabric works best for your project, and you’ll be ready to get started. Teri: Knit fabrics are my favorite to sew and wear, yet all too often my sewing friends say they are intimidated by knits. Creating a clean, beautiful neckline on a knit top can be super easy and quick. Start with your favorite pattern for a knit top and a lovely knit fabric, like Performance Piqué. 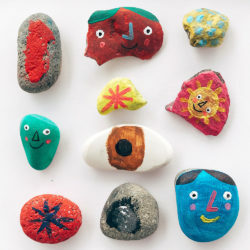 I chose this adorable print, Como se llama? by Happygoluckycreations, so the sweet llamas can cheer you on. Using your knit top sewing pattern of choice, sew the shoulder seams, then carefully trim away the seam allowance around the neckline. 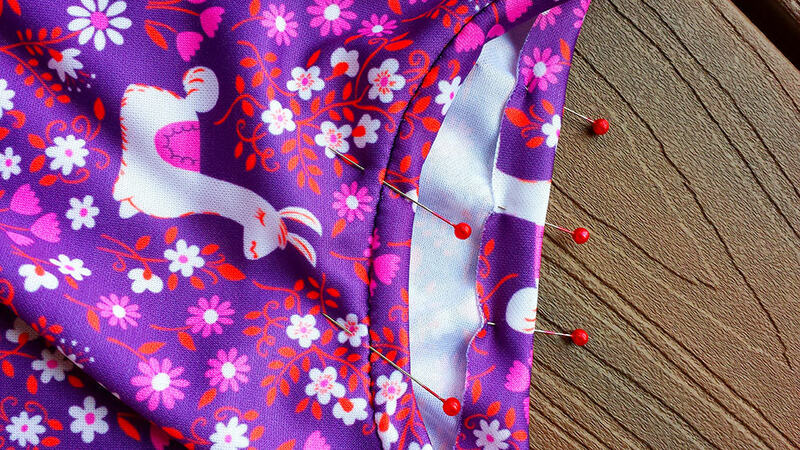 Mark the neckline into 4 equal parts using pins. The llamas are happy because you are doing a great job! To achieve a smooth neckline that does not ripple or gape open, the binding needs to be slightly smaller than the neckline. A tiny bit of stretching will keep the binding flat and close to the body. Don’t be frightened; we’re going to do a little math now. 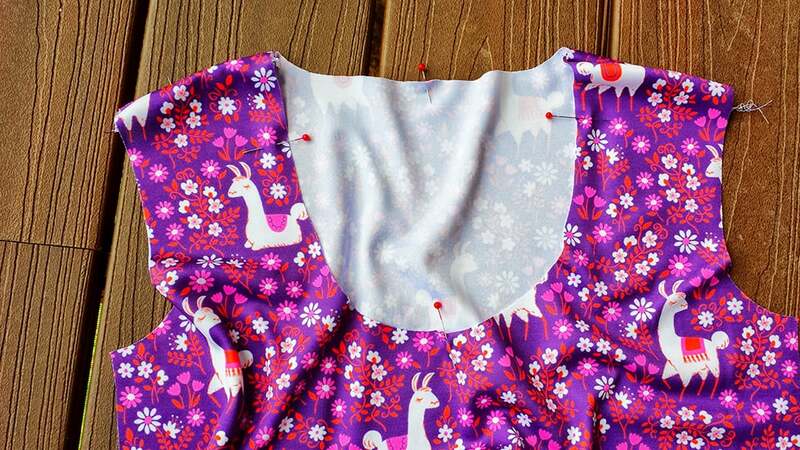 Measure the neckline opening and multiply by .90, then add ½ inch for seam allowances. For example, the neckline of my pattern is 28 inches. Figuring out the width is a lot easier because the llamas and I have already figured that out for you. Cut the binding 1.5 inches wide. 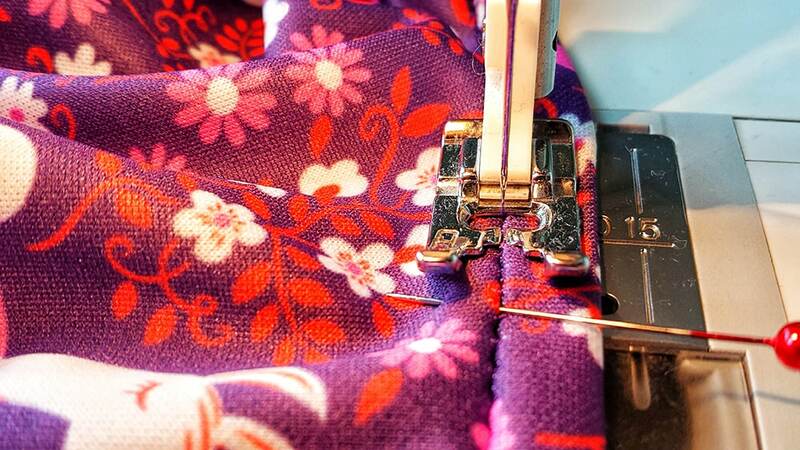 Sew the two short ends together, using a ¼ inch seam allowance. Mark the binding into 4 equal parts using pins. 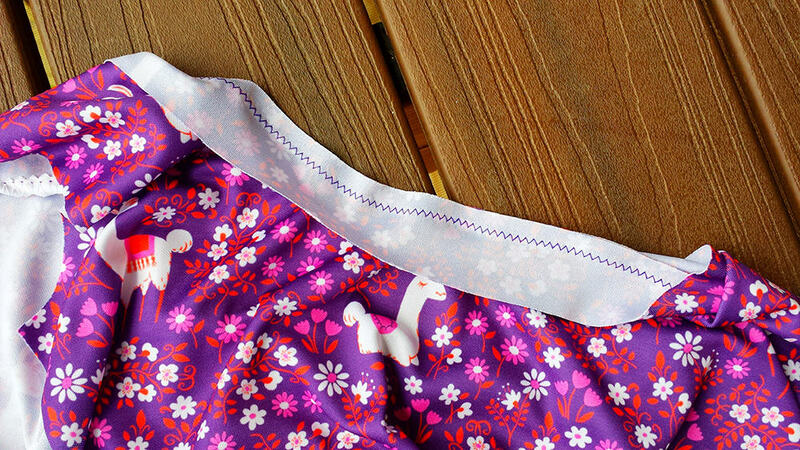 With right sides together, pin the binding to the neckline, matching the quarter marks. Remember, the binding is a little bit smaller than the neckline opening, so it won’t match up evenly. My zig zag stitch was set to 3 for length and 3.5 for width. Stitch the binding to the neckline with a ¼ inch seam allowance, gently stretching the binding to fit the neckline as you sew. Don’t worry if it looks a little wavy. We will fix that in a few minutes. This sleepy little llama certainly is not concerned about a little ripple in the stitching. Press the binding up, towards the zig zag stitching. I like to use a piece of plain cotton fabric over the knit fabric as a pressing cloth when using steam, just in case the iron decides to spit out too much water. Now, wrap the binding over the seam allowance and to the inside. Pin the binding in place, making sure that the binding fully overlaps the zig zag stitching on the inside. From the right side, “stitch in the ditch” (in the existing seam line) between the body of the shirt and the binding. It takes a bit of concentration to keep the needle in the right place. This gets much easier with practice. The last step is to press the neckline with a good shot of steam to eliminate any waviness from the stretching and stitching. The llamas are so proud of you for making such a beautiful neckline! This technique is not just for necklines. 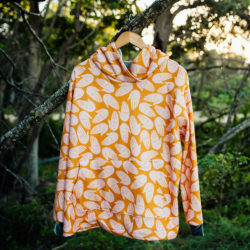 It is a great way to finish armholes and even hems on knits. I hope this technique will make sewing with knits more fun and less fussy. 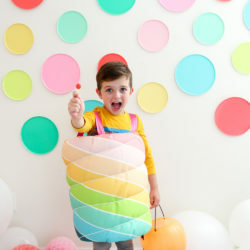 Share links to your favorite sewing with knits tips + techniques with us in the comments below! 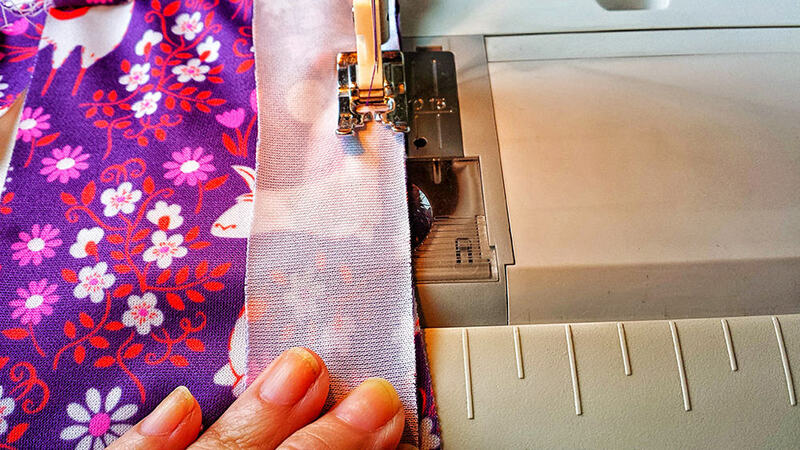 maybe you should consider using a twin needle so that the stretch fabric can work with the stitch. if you use af single needle stitch the stictch will brake when you stretch the fabric..
Or use a stretch stitch (or serge if possible). I’d also point out that there’s a specific foot for stitching in the ditch that comes with a lot of newer machines. It has a blade like piece that goes ahead of the needle to keep it in the ditch, but check your needle position to make sure the needle lands where you think it will. Oh, and great fabric, happygoluckycreations! Lovely, a simple zigzag is every bit as good as using a twin needle. This is my preferred binding method and I’ve tried a lot of them. do you zigzag or do a straight stitch when you stitch in the ditch? I’m confused. The first sewing picture is a serger, looks just like my Brother 1034D. You’re not doing a zig zag. Then in the next picture, there’s a straight stitch showing, which wouldn’t have been from the serger OR a zig zag. I don’t see a zig zag stitch anywhere. The last picture showing stitching ON the binding, not in the ditch. Do we follow the text or the pictures? We’re sorry for the confusion! Please follow the written instructions and stay tuned for updated photos! We’d love to hear how it goes!